ring out with astonishing speed and clarity," and the bass, once properly adjusted, is "deep" and "tuneful." Features Hybrid flat-ESL/dynamic speaker with transmission-line bass loading; stepped bass-level control for optimizing in-room low-frequency response and integration of ESL panel and dynamic woofer. Use Setup was "surprisingly simple," taking Andrew less than a half hour, with the help of a test CD and SPL meter; but once the speakers are set up, "the Isis sweet spot is no more than about two feet wide." Value "At $2750, the Innersound Isis is a stellar bargain." Innersound first came to the attention of the audiophile community with the release of the Eros hybrid electrostatic loudspeaker in 1998. The Eros broke much new ground for a commercial ESL design, featuring a flat, rather than curved, electrostatic panel, a dynamic woofer with transmission-line loading, and an active crossover with dedicated 200Wpc solid-state bass amplifier (see Innersound's website for a lucid description of the transmission-line concept). Quite deservedly, the Eros garnered rave reviews in the audio press (including one in the December 1998 issue of SoundStage! ), but had a somewhat limited audience due to its $4995 USD price tag. In order to capture a larger proportion of the burgeoning ESL market and compete head-to-head with entry-level ESLs like the MartinLogan Aerius i, Innersounds chief designer, Roger Sanders, set out to design a speaker with much of the Eros sonic magic, but at a much lower price point. Sanders efforts have resulted in Innersounds second hybrid ESL, the Isis. Clearly, some tradeoffs had to be made in order to bring the Isis to market for $2750, nearly half the price of the Eros. Gone is the active crossover and dedicated bass amplifier of the Eros, replaced instead by a more traditional, and less costly, passive crossover. Gone also is the Eros 10" woofer and 8' transmission line in favor of a more economical 8" woofer coupled to a 5' transmission line. The crossover point and slopes are drastically different as well, the Isis crossing the woofer over to the panel at 900Hz, as opposed to the Eros 450Hz. The higher crossover point, coupled with a shallower crossover slope (not precisely specified by Innersound, but said to be shallower than the Eros 24dB/octave slope), has brought a somewhat warmer, more forgiving midrange to the Isis, making it more suitable for systems on the lean side of neutral. The Isis 8" woofer is a proprietary Innersound design and manufactured in Europe. The driver makes use of a patented magnetic damping system, huge magnet structure, cast frame, and a very light, but stiff, woven paper cone doped with baxtrene. Although some Innersound customers have felt the need to partner the Isis with a subwoofer, the bass driver, coupled to its transmission line, is quite capable of reproducing frequencies as low as 34Hz -- sufficient for all but the most demanding organ music, and more than low enough to meet the challenges of the music I threw at it. The electrostatic panel used in the Isis shares its design with that of the Eros and borrows its elder siblings audio transformer and high-voltage power supply. As noted earlier, the panel is flat, rather than curved as in most popular electrostats -- ironic considering designer Sanders invented the curved ESL panel (those interested in the design of both full-range and hybrid ESLs should seek out Sanders book on the subject, entitled The Electrostatic Design Cookbook). Sanders chose in favor of a flat-panel design due to its narrower dispersion pattern. While a speaker with narrow dispersion produces a relatively small sweet spot, it will interact far less with the listening rooms boundaries and will, therefore, be easier to place. Those short on space will be happy to hear that the Isis is somewhat smaller and more room friendly than the Eros, although its still a relatively large speaker by most standards. Standing 62" tall, and with a width and depth of 11.5" and 14" respectively, the Isis, cloaked in textured black MDF, managed to dominate the landscape of my 19W x 17H x 10D listening space. Think the monolith from Kubricks 2001 and youll be most of the way to visualizing the Isis appearance from your listening seat. The rear panel of the Isis contains two pairs of high-quality, gold-plated five-way binding posts, enabling easy bi-wiring. Jumpers are supplied if single-wiring is preferred (all of my listening was done in single-wire mode). An IEC outlet is supplied to connect the electrostatic panels power supply to an AC outlet via one of two supplied power cords. While an after-market power cord could be used for such an application, I used the stock cords throughout my auditioning. Rounding out the rear panel is a stepped bass-level control that can be used to mitigate the woofers output in an effort to optimize in-room low-frequency response. This control proved useful for obtaining just the right balance between the woofer and electrostatic panel. Setup of the Isis is surprisingly simple, as its narrow dispersion in the high frequencies results in far less room interaction than wide dispersion designs. Using the Stereophile test CD and the Radio Shack SPL meter, with final tweaking done by ear, I achieved reasonably flat response at the listening position in under a half hour. In their final position, the speakers sat 8'6" apart, 4'4" from the rear wall and 9' from the listening position. In accordance with Innersounds setup instructions, the speakers were toed in towards the listening seat so that my reflection was centered in the ESL panels. With the speakers so aligned, the soundstage carved out by the Isis was tightly focused, and image outlines were razor sharp. The relatively sharp image focus of the Anthony Gallo Acoustics Nucleus Solo (now sadly discontinued in favor of a line of Bose killers) seemed rather amorphous in comparison. Please note that when the speakers are set up, the Isis sweet spot is no more than about two feet wide. Outside the sweet spot the Isis treble is shelved down noticeably, the presentation becoming slightly dull and lifeless. Standing up, on the other hand, results in near eradication of the high frequencies. Auditioning this speaker at anything other than typical seated height, therefore, will most certainly not do it justice. In my room, the bass-level control's minimum setting resulted in deep, tuneful bass and an uncolored midrange. At higher settings, the bass became bloated and the midrange turned thick and syrupy. Given the room dependence of such things, finding the optimum setting for a given listening space will require some experimentation. Such experimentation is best done without the supplied spikes in place (three per speaker), as the speaker is more difficult to move when anchored down by these devices. Once set up, the Isis does benefit from rigid anchoring. The bass, in particular, tightens up noticeably with the speaker well coupled to the listening-room floor. A final setup note with regard to the Isiss electrostatic panel: Although Innersounds Roger Sanders informed me that the panel required only a second or two to be fully charged, the Isis sounded lackluster and dull on top for the first hour or so after being plugged in. Id suggest that you allow the panel to charge for at least 60 minutes before doing any serious listening. Break-in of the Isis was not the arduous task it has been with some speakers. The woofer came to life after about 10 hours or so of bass-heavy material, and the electrostatic panel changed little in character over the many months I had the review sample. Figure on about a week of average listening before you begin to hear the speaker as the designer intended. But as with most speakers, the choice of a partnering amplifier for the Isis should be made carefully. 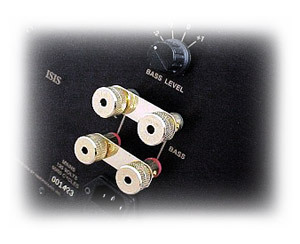 Although the speaker is reportedly fairly efficient (90dB/2.83 volts/meter), its impedance dips to a low 2 ohms in the high frequencies and could, therefore, present something of a problem for low-powered tube amplifiers and solid-staters that are less than stable into difficult loads. Sanely priced solid-state brutes from Classé, Aragon, and Simaudio would be good choices as, I suspect, would relatively powerful tube designs from Conrad-Johnson, Audio Research, VTL and others. Although not auditioned, Innersounds recently introduced Electrostatic Amplifier should also work very well. All of my listening to the Isis was done in the context of my usual reference system. Heavily analog-oriented, the systems front-end is comprised of the VPI Aries turntable with TNT Mk.V platter and bearing, VPI Synchronous Drive System power supply, Graham 2.0 tonearm, and Transfiguration Spirit moving-coil phono cartridge, all (aside from the SDS) sitting upon an Arcici Air Head isolation platform. Amplification was handled by the Audible Illusions Modulus 3A preamplifier (with John Curl-designed gold moving-coil phono board) and Simaudio Moon W-5 power amplifier, the latter easily capable of handling the Isis sharp impedance dip in the upper frequencies. All cabling was by Harmonic Technology, Pro-9 Plus speaker cable and Pro Silway interconnects; and Silver Audio, Silver Symphony 48 speaker cable and Silver Bullet 4.0 interconnects. The Silver Audio Silver Symphony 48 loudspeaker cable worked well with the Isis, but sounded a bit soft and ill-defined in the bass compared to the more incisive Pro-9 Plus from Harmonic Technology. The Anthony Gallo Acoustics Nucleus Solo loudspeakers, another hybrid melding two very different driver technologies, were on hand for comparison. Once broken in, the Isis immediately impressed with its ability to throw a sharply focused and coherent soundfield. Imaging freaks will sit spellbound as the Isis grabs vocalists in its death grip and pins them dead-center between the loudspeakers. The superb imaging ability of the Isis is almost certainly a function of the panels narrow dispersion pattern, which doesnt spray the mid and high frequencies about the room like more conventional designs. Pull out the LP of Jewels Spirit [Atlantic 82950-1] or Pieces of You [Atlantic 82700-1] for particularly startling examples of the Isiss imaging prowess, the talented singer filling the void between the loudspeakers in most convincing fashion. With its bass control set at the optimum level, the Isiss midrange was highly uncolored and wonderfully detailed. This "midrange magic," so revered by electrostatic enthusiasts, was highly addictive and one of the Isis most endearing qualities. Female voices, in particular, were a joy to behold. Sarah McLachlan (Surfacing [Classic Records/Arista RTH-18970], The Freedom Sessions [Classic Records RTH-2000]), Jewel (Spirit, Pieces of You), Nancy Bryan (Lay Me Down [Analogue Productions APA-2002A]) and Billie Holiday (Songs for Distingué Lovers [Speakers Corner/Verve MG VS-6021], Body and Soul [Japanese Verve UMV 2597]), retained the same unique vocal qualities they posses through other quality speaker systems, but through the Isis, they took on a newfound presence and a sense of "liveness" that was unmatched by the many dynamic-driver-based systems Ive auditioned. Nancy Bryans Lay Me Down is worth particular mention here for its successful blending of excellent music and superb sonics. How does a small, independent label like Analogue Productions continue to release fine, all-analog recordings of original music when so many others before it have failed? The Isis reproduction of the high frequencies was equally impressive. The nimbleness of the ESL panel allowed treble-rich instruments (cymbals, triangles, tambourines, etc.) to ring out with astonishing speed and clarity. When Ed Thigpen strikes the triangle to open "The Night We Called It a Day" from The Oscar Peterson Trios Live From Chicago [Verve 823 008-1], I nearly jumped out of my listening chair, so startlingly real was the reproduction. Ditto for Art Blakeys great snare work on Hank Mobleys Roll Call [Blue Note 84058, 180-gram reissue], which simply exploded into the room with all the power of an M-16. The Isis also possessed few of the midrange and treble distortions common to speakers utilizing non-electrostatic elements. Indeed, the level of resolution and refinement heard throughout the midrange and treble was unmatched by any of the speakers Ive spent time with recently, including the excellent Anthony Gallo Acoustics Nucleus Solo. A favorite of mine in the under-$3000 category, the Nucleus Solo sounded opaque throughout the vocal range and somewhat rough around the edges (particularly in the upper midrange and lower treble) when compared to the Isis. The successful integration of ESL panel and dynamic woofer has forever been the bane of the hybrid speaker designer, but it is here that the Isis truly shines. Unlike the MartinLogan Aerius (and, to a lesser degree, the SL3 and Request), the Isis sings with a single voice, never calling attention to the inevitable transitions between panel and cone. As Anthony di Bonaventura runs his hands up and down the keyboard during his traversal of the Scarlatti Piano Sonatas [Connoisseur Society CS 2044], the passing of the baton between high- and low-frequency elements is virtually undetectable, a feat that is critical to the successful illusion of a single instrument playing in a real space. Throughout my many months of listening to the Isis using a wide variety of recordings, my attention was never drawn to the fact that two very different transducers were responsible for the music-making. Designer Sanders has, in fact, pulled off something of a coup in terms of the integration between panel and woofer, and has set the standard to which other hybrid ESL designers should aspire. Quibbles? Naturally I have a few. Firstly, while the Isis was extended and nicely detailed throughout the midbass and upper bass, the woofer imparted a slight leaden quality to upright bass and kick drum that was heard consistently from recording to recording. Its worth noting that this is not a quality I have heard with other speakers in concert with the Simaudio Moon W-5, a power amplifier which seems to be universally capable of bringing out the best in a speakers low-end performance. That said, I cant rule out an unusual amplifier/cable/speaker interaction, nor any number of other factors, including a room effect or some attribute of the woofer, crossover or transmission-line design. Secondly, the Isis needs to be cranked up a bit before it really comes to life. When listening at moderately low levels, the Isis seemed to lack the same punch and drive I hear with the Nucleus Solos and other dynamic speakers. Being liberal with the volume control restored much of the vitality that was missing at lower levels, but night owls might be left wanting during low-volume, late-night listening sessions. Theres no need to be afraid of being a bit heavy-handed with the volume level of the Isis. It played loudly without strain whenever I dared to push it, my ears consistently giving out before the Isis ever cried "uncle." Lastly, the fit and finish of the Isis is not quite in the same league as the similarly priced competition from other hybrid-ESL vendors. The MartinLogan Aerius i, for example, has a more refined visual appearance, the edges of the electrostatic element finished with attractive wooden rails instead of the Isis review pairs more frugal-looking anodized-aluminum end caps (wood trim is available at no additional charge). Of course, the proofs in the listening and, visual considerations aside, I preferred the Isis to the more dapper Aerius i, particularly its superior integration of panel and woofer. At $2750, the Innersound Isis is a stellar bargain. Through careful application of trickle-down technology, designer Roger Sanders has managed to produce a passive incarnation of his highly regarded Eros active hybrid system at nearly half the price. Sanders has further managed to duplicate the feat of seamlessly marrying an electrostatic panel to a dynamic woofer, an achievement that most designers would be thankful to manage even once. If youre looking for a speaker system with that elusive electrostatic magic (i.e., a beautifully detailed and uncolored midrange coupled with an extended, fatigue-free treble) but are unwilling to give up the low-end power and extension of a dynamic bass driver, then youd best put the Isis on your short list. It could just be the best under-$3000 speaker youve never heard. Price: $2750 USD per pair.